“Faces of Mission” is a bi-weekly blog series produced by the United States Catholic Mission Association highlighting our membership and all their work in and for mission. This week we feature Sr. Fidelis Marie, OSB and Sr. Madeleine Miller, OSB, Missionary Benedictine Sisters. Sr. Madeleine Miller, OSB and Sr. Fidelis Marie, OSB are both preparing to make their final profession of vows with the Missionary Benedictine Sisters in October 2015. Different journeys have led them to their decision to enter a missionary religious community. 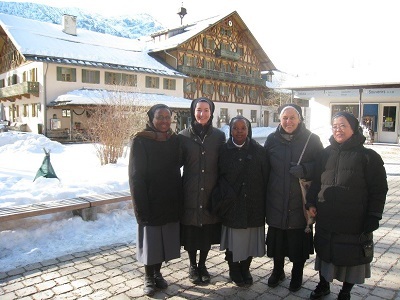 They have both recently returned from three months of exposure to the reality of mission that is an integral part of their community life as Missionary Benedictine Sisters with their community; Sr. Madeleine returned from three months in Brazil and Sr. Fidelis Marie returned from Germany. Sr. Madeleine became a Catholic in college. While studying abroad, she was introduced to the Taize community in France where she experienced a spiritual awakening that touched her deeply. A silent retreat in Taize led her to a spiritual awakening as she became aware of deeply spiritual desires. She felt welcome among this community, attracted by their monastic life, the beauty found in their simplicity, their dedication to service, as well as their ecumenical and international representation. Her spiritual journey became clearer as she pursued graduate studies. With the help of a spiritual director she was able to discern her vocation. She experienced monastic life with a community of sisters, but was drawn to the Missionary Benedictine Sisters in 2008 because of their missionary commitment. Sr. Fidelis Marie found that she was attracted to the whole lifestyle that the Missionary Benedictines pursued. Both Sr. Madeleine and Sr. Fidelis Marie emphasize that there were aspects of the Missionary Benedictines that were unique to this community and which drew them in: a community with an international witness, a blending of monasticism and mission, a charism to proclaim the Gospel to those who do not know Christ, and an emphasis on joy and authenticity. The age and ethnic diversity particularly were attractive for Sr. Fidelis Marie. Rooted in the Benedictine Spirituality, the Congregation of the Missionary Benedictine Sisters was founded in 1885 especially in view of mission. As a monastic community, they follow Christ and serve wherever the Church is in need, at home or abroad. They strive to bring Christ to places where He is not yet known or where He is insufficiently known. Their lifestyle consists of living and working together in community, under a rule and a superior. The Liturgy of the Hours and the Eucharist form the core of their common prayer life. They wear the monastic habit as a sign of their commitment to Christ, His Church, and their Congregation. Taking monastic vows of Obedience, Stability, and Conversion of Life, they bind themselves to Christ as well as to one another in the community. Sr. Fidelis Marie recently returned from a three-month experience in Dresden, Germany where she was exposed to a different mission reality. Observing how one of the sisters who worked with Caritas received refugees, she learned from them as she listened to their stories of why they were fleeing – refugees from Kosovo, Syria, and Lebanon – gave her a new perspective on the unity of Christians that shines through in spite of the denominational differences. She also was able to hear of the same sister’s work in the parish, helping to form lay catechists in an area in which only 4% of the population is Christian. The closeness of the community and the example of the sisters educating and teaching the faith impressed upon her the need to continue to minister to these parts of the world. 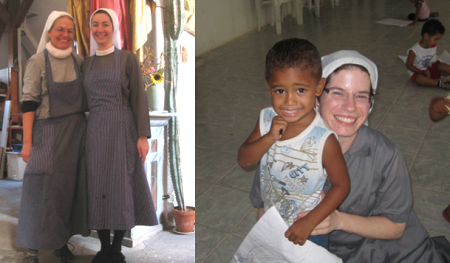 Sr. Madeleine served at a kindergarten in a slum in Brazil. One day a girl came to her classroom and simply stood and cried with no explanation. After several failed attempts to understand why she was crying, they realized that she was hungry. They served her a meal, which she sat and ate as if she had not had a meal in months. After a few more months at the school, being provided with proper meals and playing with the other children, the child grew and showed astonishing progress. Sr. Madeleine was touched by seeing this transformation, impressed by the impact that education can have in the lives of these children. “It is something that you cannot take away from them,” once they have been given an education, she says. If We Aren’t There, Who Is? Both sisters are deeply committed to mission which they say is still relevant to our world. Sr. Fidelis Marie adds, “God calls everyone to be a missionary. If you are in love with the Lord, you can’t help but be a missionary.” Pope Francis has emphasized the call of every baptized person to “missionary discipleship,” she says, but it will look different depending on one’s particular vocation. “Mission can be a married woman teaching her children. Mission is a nun who never leaves the convent but prays for souls.” Each one has a responsibility to discover how he or she is particularly called to be missionary disciples. Do they know what comes next? 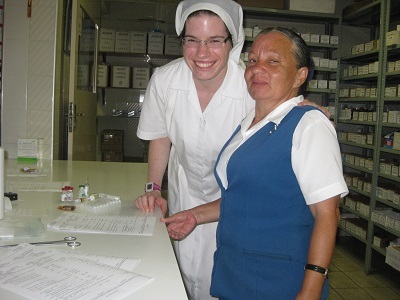 “That is one of the joys of religious life,” Sr. Madeleine says, laughing. Going forward, the sisters emphasize that they must be flexible, to discern with their community, and then to be open to where they are sent. They are inspired by the examples of their elder sisters, whose lives are a testament to what God can do when one is faithful and willing to be an instrument for his will.